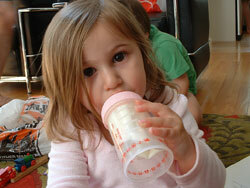 The US Food and Drug Administration (USFDA) banned use of Bisphenol – A (BPA) in baby bottles in July 2012. The ban was announced on the request from American Chemistry Council, the chemical industry’s main trade association in US, to phase out the use of the chemical. The US chemical industry have already stopped using BPA in baby bottles and the request by the council is being seen as a step to establish goodwill among customers. FDA had earlier maintained that use of BPA at current exposure levels is safe. It had rejected the citizen petition filed by Natural Resources Defense Council (NRDC), an environmental group based in New York, to ban the use of BPA in all food containers and packages earlier this year in March. This ban is however not applicable to other plastic products that contain BPA. The use of BPA in baby bottles has already been banned in many countries including European Union and China. The exposure estimate for potential age groups to BPA has come down considerably in US. According to USFDA report released in March 2012, the current exposure levels are 0.2-0.4 μg/kg body weight/day for infants and 0.1-0.2 μg /kg body weight/day for children and adults while the earlier exposure levels were 2.42 and 0.185 respectively. BPA, which makes plastic hard, has been used in food containers, baby bottles, cans and bottles for packaged drinking water. It has been linked to cancer, birth defects and heart diseases. The BPA used in bottles has been found to leach in food and thus making the exposure to it quite widespread. A study conducted by Centers for Disease Control and Prevention (CDC) in US in 2003 found BPA residues in 93 % of the urine samples. While countries are taking steps to ban BPA, in India there neither any regulations to check the human exposure to BPA nor are there any limits set for the allowable intake.